The Convent of the Immaculate Conception Monastery, located on a hillside just east of Ferdinand, is the mother-house of the Sisters of Saint Benedict of Ferdinand. The Convent was founded in 1867 in downtown Ferdinand when four sisters arrived to oversee the schools established by Father Joseph Kundek. The Sisters outgrew that structure by the 1880s. They found the current 190-acre location and built a larger church, house, and school between 1883-1887. This complex, known as the Academy, contained all of the community’s activities for almost 50 years. The next building campaign started in 1915 when the chapel and two new Academy buildings were planned. However with the advent of World War I, work was halted and did not resume until 1922. 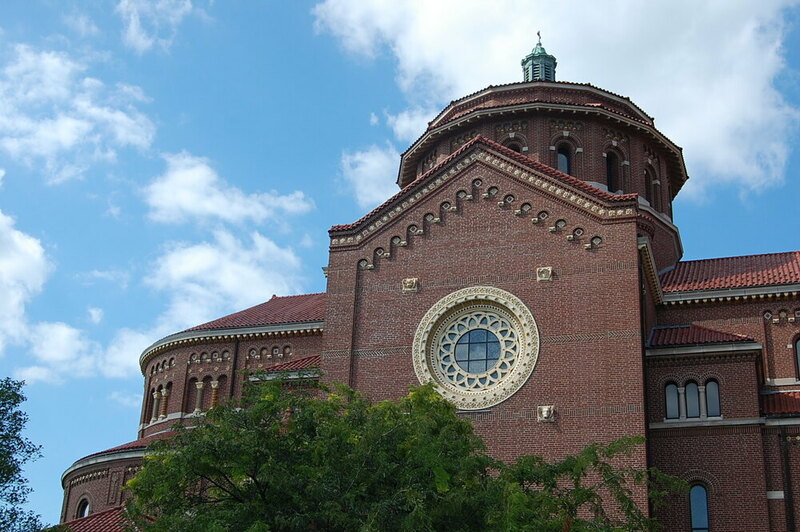 The chapel, designed by St. Louis architect Victor Klutho, was completed in 1924 and features a 400-seat sanctuary adorned with 47 stained glass windows, a cloister hall, colonnades around the centralized dome, a large crypt auditorium, and two small residential wings. Nearly 1000 sisters have resided at the Convent over the years and the community has reaped the benefit. They first opened a school in 1870 and today operate the Marian Heights Academy, an accredited high school for girls. In the early years, the Convent ran St. Benedict’s Normal and St. Benedict’s College, although both have ceased operation. The sisters also own and operated St. Joseph’s Hospital in nearby Huntingburg. Other social and humanitarian endeavors undertaken by the Sisters of St. Benedict include teaching, nursing, and social work, psychology, caring for the physically and mentally handicapped, and working as medical assistants, hospital administrators, parish workers, and missionaries. The Convent also reflects the strong German heritage of the community and holds a collection of artifacts that came from the motherland. There are collections of German literature and music and German inscriptions can be found throughout the buildings and the Convent grounds. The sisters also hold a private art collection with a series of works obtained from 19th-century Germany. The chapel itself consists of several decorative elements that were brought over from Germany including the sanctuary screening, pews, confessionals, and lectern. The Stations of the Cross were carved in Munich and the 47 stained glass windows were created there. The sisters also possess a large library and archives with books and documents of German origin. Indiana Division of Historic Preservation and Archaeology, “Covenant of the Immaculate Conception Monastery,” Discover Indiana, accessed April 25, 2019, https://publichistory.iupui.edu/items/show/363.